So many Australians want to explore our beautiful and vast country, however many are daunted by its very size and remoteness. Thankfully, technology now allows us to venture beyond the range of mobile phones, confident that if something does go wrong, there is a safety net available to us. Unfortunately, people are still getting lost and dying because they haven’t taken a few simple and affordable precautions. A breakdown or a minor injury should be an inconvenience, not a battle of life and death. This is not a Bear Grylls survival guide. This is a practical book based on my years of experience rescuing ordinary people in remote areas. As a Search and Rescue Coordinator, I have been involved in extensive searches for people who have made some fundamental mistakes in their preparation. Unfortunately not all of these searches have been successful. I have also seen many people rescued, who were well prepared, and were able to alert authorities that they needed assistance due to their remote communication plan working. There are now so many products on the market that allow us to communicate in remote areas, or in an emergency, that finding the right one for our needs is difficult to do. If you’re confused as to what the various items do, how they work or what will happen once you have pressed the emergency button, then you are not alone. Many people do find the range of products confusing, and I am often asked what is the best piece of equipment they should carry. Not only does this e-book show you how to get help if you’re stranded, but it is the only place you can compare 406MHz PLBs, SPOT Messengers, inReach satellite messengers, TracMe UHF beacons, as well as being the only place you can find the telephone numbers for Police Stations that are manned 24 hours a day in all of Australia. This is of vital importance if you choose to buy a satellite telephone. It e-book is essential when determining your remote communication plan. Save Our Selves explains the differences between beacons and satellite messengers allowing you to make an informed choice before you buy one or the other (or both!). It clearly explains the search and rescue process and what to expect once you’ve notified authorities that you require assistance. So who should buy Save Our Selves? Save Our Selves is perfect for couples or families about to set off travelling around Australia. It explains the best ways to stay in touch with family and friends, whilst also providing a safety net. It is also extremely popular with friends of those fortunate enough to be about to set off on a great adventure. Many copies are bought as gifts by loved ones. This e-book is valued at a low $30.00, a fraction of the cost of one of these devices, saving you from making a potentially costly mistake by buying a beacon that doesn’t suit your needs. After spending 12 months on the road, living the travelling dream, I realised that many families had their holidays all but ruined due to inadequate preparation, a lack of understanding as to what they would be doing, or what some would call plain bad luck. 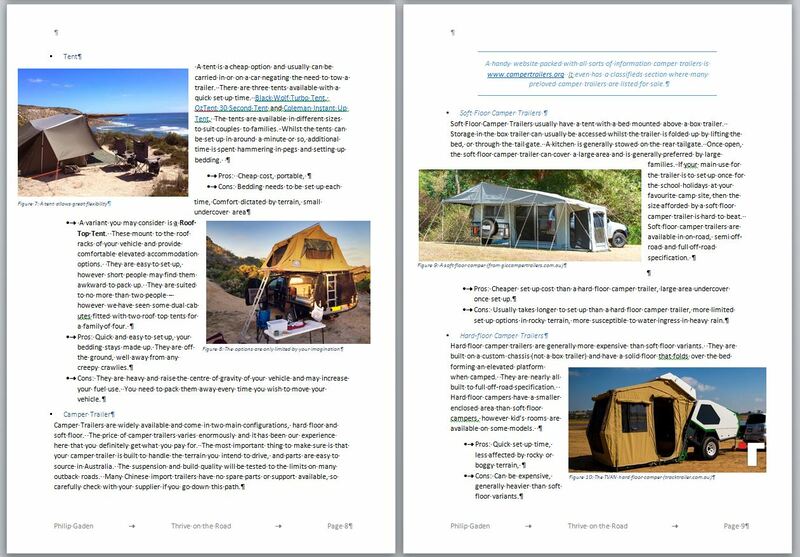 My solution was to collate all the lessons we learnt in our preparations and whilst we were travelling into a second e-book Thrive on the Road, Tips and tricks to make your holiday on the road every bit as enjoyable as it should be. Thrive on the Road will give you all the best information available to ensure that your holiday on the road is fulfilling, enjoyable and stress free. It is often said you make your own luck, and this e-book shares with you many of our tips that turned a good holiday into a great holiday! And the best bit is that I will give you Thrive on the Road absolutely free! Because I am passionate about sharing this information and potentially saving your life, I am offering the e-book Save Our Selves for the special discounted price of just $30.00 $9.95! You should buy these e-books now – One of them may just save your life or the life of someone you love. The other might save your marriage! There is no point having wishing you had purchased this book, when you’re stuck in a remote area and desperately need assistance.